CCDG recognises that its wide range of activities and services have both a positive and negative impact on the environment and wish to manage and minimise these wherever possible. To help us achieve this aim we have implemented the independently audited Green Dragon Environmental Standard. Our overarching principles are detailed within our environmental policy and are implemented and monitored through the use of an environment management system. CCDG’s aim is to seek continued improvement in the process by which we manage our environmental impact. To facilitate this improvement all our offices now have individual responsibility for the implementation of the environment management system. This has allowed each office to establish a unique eco code that best fits the environment they work in and to establish achievable reductions in the resources they manage. Monitoring data for gas, electricity, water consumption and staff travel are collated on a monthly basis. Three staff within the facilities department have been given overall responsibility for undertaking analysis of the data and to undertake six monthly audits of the offices under their control. All legal requirements that are applicable to Careers Wales have been documented in the Environmental Legal Register which is updated every six months. All waste transfer notes, COSHH risk assessments and MSD product sheets are kept at a local level and they are checked during internal audits. The most significant environmental aspects are documented within the Environmental Aspects Register. 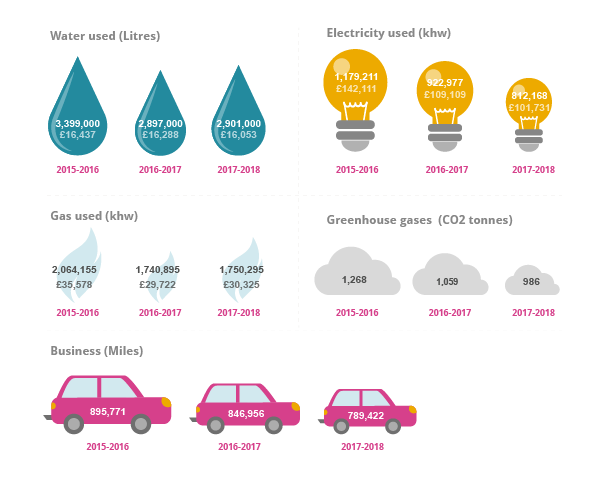 To support the national direction as detailed within The Welsh Government’s Sustainable Development Scheme, ‘One Wales, One Planet’ coupled with the Well Being of Future Generations Bill, CCDG have identified the activities that generate greenhouse gases. We have identified two areas: Carbon Dioxide from travel and energy use. This financial year we have progressed with our estates strategy resulting in the closure and relocation of a number of offices. The environment CO2 data has been collected from the 29 offices that are under our control. We have included data from offices that have closed part way through the year. This year we were awarded Green Dragon Level 4. We achieved a 6.3% decrease in our emissions from 928 tonnes to 870 tonnes. However, we had a slight increase in our water consumption, we are currently reviewing each office to determine the most effective water saving measures to introduce. The most significant improvement was observed in the electricity consumption. We also achieved a reduction in business mileage and we will continue to reappraise the mode of transport staff use to travel, we have invested in video conferencing facilities in our offices, staff have been provided with skype facilities and we have introduced a cycle to work scheme. In the next financial year we have set ourselves an ambitious target to reduce our CO2 emissions by 8%, we have also targeted selected offices to apply for level 4 of the green dragon award. Our energy audits have identified the five worst performing offices in terms of CO2 emissions and we will be making an investment this year to reduce the output from these offices. Reduce our carbon footprint by reviewing all premises with a view to implementing strategies which will improve their environmental impact. Review business strategy to minimise staff travel. Assess the viability of increasing the biodiversity of all external areas that we have effective control over. Improve waste management processes by helping us achieve higher levels of business waste recycling. Set aside a proportion of our annual maintenance budget to ensure that we can achieve these objectives.